Some time ago I wrote about how I sort and store my paper scraps by color. (click here to read more about my scrap paper storage). I have had this system in place for the last several years and it is awesome! Case in point: this week when I was looking for paper to make cards I found all the patterned paper and coordinating cardstock that I needed quickly and easily because it was all neatly organized. Hooray for finding my supplies quickly and getting down to the business of creating. 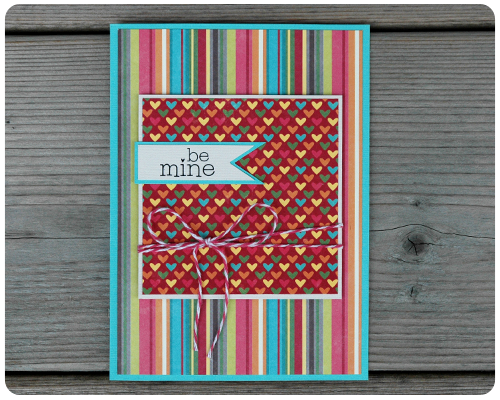 With my scraps in hand I was able to make two cards. A grid card. And a small note card. By creating these cards this paper, that I bought for a layout who knows how long ago, got a bit more mileage. Being able to find and match up my scraps quickly and easily allows me to complete more projects with them which helps to stretch my crafting budget. 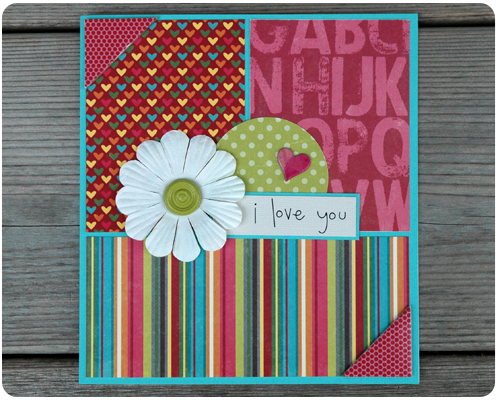 I should mention that it was by complete accident that this post where I talk about my love of scrap papers and how useful and handy they are includes pictures of cards made with heart paper. Completely coincidental, honest; it's funny, yet fitting, how that worked out. So now, I need to ask, what do you do with all your paper scraps? Save them? Toss them? Are they neatly sorted? Are they on a random pile? Please share your system and how it works for you. BEAUTIFUL Card. Love the corners!